Carole Nash Insurance has announced a new policy aimed at young riders on small capacity bikes. The policy will cover riders of 16 years and over on 50cc mopeds. For some time now MAG Ireland has been pressing all of the Irish insurers to look again at the options offered to young riders in particular. 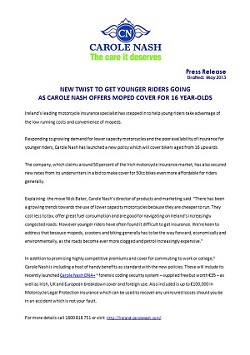 In that context we in MAG Ireland welcome this announcement from Carole Nash as a positive development for the market in general and especially for young riders who have traditionally been burdened with high insurance costs.